A drama about friendship and loss, Reign Over Me treats a difficult topic with sensitivity but eventually spreads itself too thin. In New York City, Dr. Alan Johnson (Don Cheadle) is a successful dentist, married to Janeane (Jada Pinkett Smith), although tensions are developing in their relationship. He anyway resists the sexual advances of new patient Donna (Saffron Burrows), and clumsily tries to get advice from therapist Dr. Angela Oakhurst (Liv Tyler). Alan then spots his old college roommate Charlie Fineman (Adam Sandler) roaming the streets on a motorized scooter. Charlie lost his wife and three daughters in the September 11, 2001 terrorist attacks, is suffering from severe post-traumatic stress disorder, and has withdrawn into a shell of a man, spending most of his time playing a video game and repeatedly remodelling his kitchen. Alan makes a big effort to reach out and spend time with his friend, and as a result drifts further away from his own family. Charlie meanwhile refuses to talk about his personal loss, leaving Alan to wonder how much he should push Charlie to seek professional help. Written and directed by Mike Binder, Reign Over Me delves into the world of grief and dysfunction caused by immense loss. 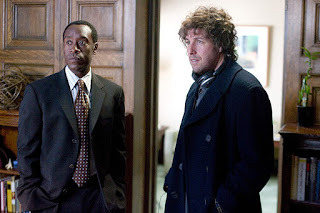 The subject matter is not easy, but an astute script and two excellent central performances from Adam Sandler and Don Cheadle keep the film grounded while avoiding excessive sentimentality. The film boasts a sleek look, with plenty of nighttime filming as Charlie's owl-like existence draws Alan away from his routine world. A large part of the film's appeal comes from Dr. Johnson's own troubles, at home and at the dental office. Trivial in comparison with what Charlie is going through, Alan is nonetheless heading towards his own sea of unhappiness, albeit in slow motion. He will also experience changes through his renewed relationship with Charlie, and the film is about two men at individual inflection points helping each other, one more knowingly than the other. Reign Over Me is enriched by provocative secondary characters orbiting Alan's world. Binder surrounds Alan with three women each capable of swinging his pendulum for better or for worse. Donna may be a predator, a victim or an inspiration; Dr. Oakhurst is either too young or perfectly positioned to help; and Janeane can drive Alan away from their nest or support his need for breathing room. Charlie meets and interacts with all three women, altering their role and dynamic relative to Alan. 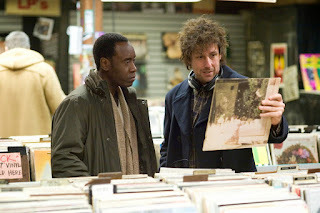 Despite Sandler proving again that with the right material he can deliver as a convincing and serious actor, Reign Over Me stumbles and almost falls in its final act. Therapy sessions morph into an ill-conceived mini courtroom drama (with Donald Sutherland making a late appearance as the judge), and suddenly Charlie's poorly defined in-laws (Melinda Dillon and Robert Klein) become central to a story that is not their own. The limp finish is unfortunate, but Reign Over Me is an otherwise courageous scooter ride into men's mental grief territory.